In the world of showbusiness there is always something strange going on behind the scenes. One can steal the other’s idea and sell to the world under different name and so on. But how to present that idea in a film to show the true meaning of the world where our most beloved musicians came from? Regardless, one thing I know for sure is that the entire cast and crew of Popstar: Never Stop Never Stopping must be sued for making such a criminally ridiculously funny film that can kill… in a good way. It kills everything negative you have in your mind and allows you to enjoy backstage satire in a way you, I am certain, would not even have attempted to anticipate. Connor is a pop star who performs unacceptable songs with irritating lyrics. The worst part of it is he does not even realise that. He sees himself as the one of the greatest singers on Earth and continues embarrassing himself in a way some other serious musicians would have quit stage for good before even reaching that far. While Connor4Real continues telling his story in a documentary format film, you will get a chance to get closer to the backstage life of a musician; his hopes, ups and downs, and of course the end when he finally learns what he needs to do in order to stop being a complete joke. As the story unfolds, Connor4Real is getting ready to release his first single from one of the most disastrous albums you will ever hear. However, the positive part of Connor’s failure is the fun he brings to his fans and the rest of the world. He always comes up with queer ideas for his shows that at the end of the day ends up in the breaking news. For that he needs to, again, be grateful to himself when he comes up with another brilliant idea to entertain the audience, where he ends up completely naked on the stage. Popstar: Never Stop Never Stopping brings everyone you know to this film, starting with Mariah Carey, Seal, Justin Timberlake and ending with Michael Bolton. Most of them appear as interviewees who share their memory about the musician. Of course, while they have nothing good to tell about Connor4Real, it’s still hilarious the way they describe him. Believe me, all those scenes deserve a separate award, which I am hoping this film will get. Every single scene contains incredibly hilarious lines that will cause a non-stop laughter throughout the film. But you have nothing to worry about, as you most likely won’t be the only one who will laugh at them the entire film. In conclusion, despite the silliness of the plot, which was intentional, this I must say, is one of the most unusual comedies I’ve seen in a while. While I am not a huge fan of this kind of movies, I found myself enjoying every minute of it, especially the soundtrack. In the end, it’s a great movie that will relieve all the stress you had gained during the day. It has the power of relaxation and ability to grab your attention. 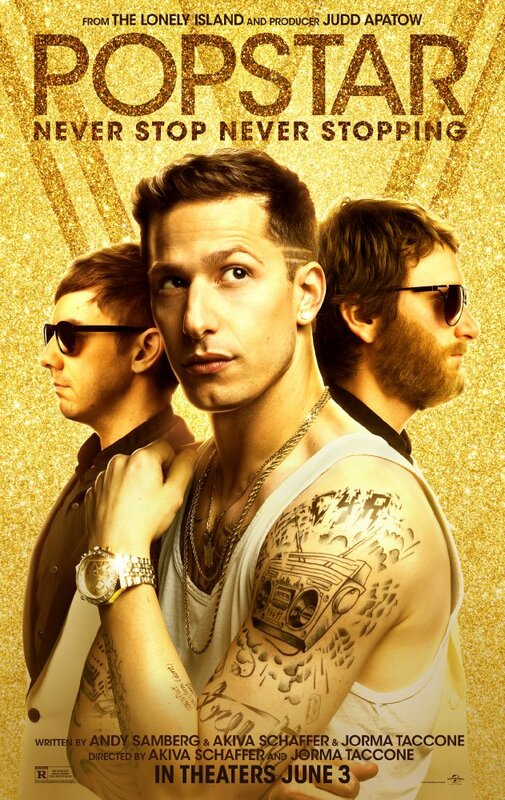 It will teleport you into a world you wish would never exist, in the meantime, be grateful for if not the show business, we would have never gotten a film like Popstar: Never Stop Never Stopping to enjoy.